Theatre has always been welcomed and enjoyed at Bloomsburg University. From the 1800s to the present, through the Literary Societies, student organizations, clubs, and as an academic major, theatre at Bloomsburg has grown tremendously. Beginning in 1924 the Bloomsburg Players brought life and creativity to campus. Weekly meetings, performances in towns, to Summer Shows with Hollywood’s best. 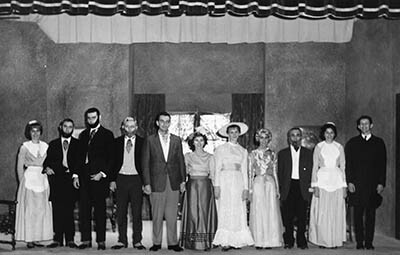 During one of the busiest times for the University Players, approximately one hundred and fifty shows where performed between 1960 and 1990. Left behind are photos, programs, cast lists, scripts, rehearsal schedules, costume receipts, lighting plots, yearbook pages, and newspaper clippings among many other documents. The bulk of this collection was hiding in offices and storage until recently. This exhibit is an exploration of the Bloomsburg Players split into three decades. Each case displays four plays that try to represent the types of theatre that were common throughout that decade. The 1960s were a time where theatre started to bloom and the season expanded into summer stock and new venues. The 1970s, a time for advancement in professionalism, school paper representation, and new types of shows. Finally, the 1980s was a time of recruitment and conversation about school life and the gay community. The exhibit was created by History and Theatre major Kira Loux and features numerous photographs, newspaper clippings, and many of the items previously listed. Please visit for yourself to see the journey of the Bloomsburg Players during their golden years. The exhibit can be found in the flat cases in front of the University Archives on the third floor of Andruss Library and will be on display until September 6, 2019. The University Archives periodically creates online or 'virtual' exhibits to highlight the Archives' collections and the history of Bloomsburg University. The first such exhibit is Bloomsburg State Teachers College in 1959. This is a pictorial look at the campus of 40 years ago, complete with historical and current information on all campus areas that existed at that time. The second online exhibit by the University Archives is entitled A Gallery of Presidents and History of Bloomsburg University, an in-depth look at the history of the University with detailed biographical information on each of its presidents. The third exhibit is Views of the Bloomsburg State Normal School, 1921-1923, a look at the state normal school using photographs and information from the course catalogues. The fourth exhibit is the 1919 War Hero Memorial Pinery, which examines the history of the World War I memorial located near Carver Hall, and provides biographical information on the 16 students who are remembered there. A fifth online exhibit is The Maine Experience: Bloomsburg State College Summer Art Classes at Moosehead Lake, 1975-79, which remembers the summers during the 1970s that art students from Bloomsburg went to the wilds of Maine to paint, draw, learn their craft and experience life. The sixth is A Legacy of Champions: The Story of Wrestling at Bloomsburg University, which documents the history of the wrestling program at the University from its founding in 1930 to the present day, featuring many of our individual and team champions from over the years. The seventh is The Navy V-5s at the Bloomsburg State Teachers College, telling the story of the naval flight instructors who trained in Bloomsburg during World War II.